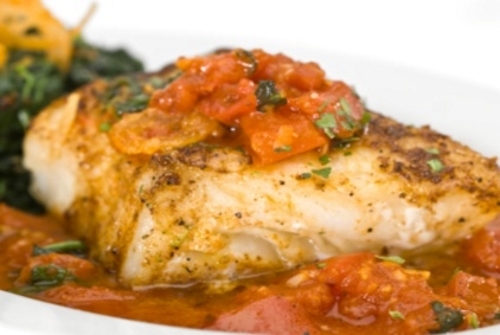 Delicious This Sea Bass Pomodoro recipes is an unbelievably delicious dish. You can use canned tomatoes for this recipe but fresh tomatoes will truly enhance the flavor of the sea bass. The pancetta added to the Sea Bass Pomodoro sauce also gives it a distinct unexpected flavor. Unlike American bacon, pancetta is cured with a variety of herbs, spices and garlic. A great chef's technique for cooking the sea bass, or any thick cut of fish or meat, is pan roasting. This technique gives the fish or meat a nice crust and moist juicy interior. All you need to do is to place the pan over medium to high heat. Get the pan very hot then add a little olive oil. When the olive oil is heated but not smoking add the seasoned fish and cook for about 2 minutes on each side to create a nice crisp crust. Place the pan into a 450 degree oven and cook for 4 to 5 minutes. While cooking the sea bass you can prepare the pomodoro sauce. To plate the Sea Bass Pomodoro all you need to do is place some of the sauce at the bottom of the plate, top with the sea bass and then top the fish with more sauce. The results should be a nice plump, moist, tender fish flavored with a bacon tomato mixture that you will truly enjoy. Serve with a side of sauteed green beans or spinach and your all set. In a large pan saute the bacon in the olive oil until slightly crisp. Add the onions and the garlic and cook for and 2 minutes. Add the chopped tomatoes, chicken broth and wine and cook for another 2 minutes. Add the basil, oregano, 1/8 cup of parsley, salt and pepper. Cook for around 20 minutes over medium heat until the sauce thickens slightly. Plate the sauce and the sea bass, garnish with the remaining parsley and serve.